Today, I hit Paris's Conservatoire National des Arts et Métiers. It's an amazing museum full of scientific instruments and machines, mostly from the 18th and 19th centuries. Coming off of PopSci's Repurposed Tech contest, it struck me how single purpose these early machines were, and yet how stunning the level of craftsmanship and engineering that went into everything from early printing presses to astronomical clocks. See for yourself: Here's a quick gallery of some of the highlights. And let me apologize in advance: Most of the signage was in French, so my details on some of these things are sketchy; also, they didn't allow flash photography and I only had my little Elph pocket cam, so forgive the slight fuzziness. come on folks, the first picture was not an "electrical generating device"! it was a nine cylinder, two stroke, radial aircraft engine. probably of the early "30's". very nice craftsmanship! surprising for french design of the era. usually not up to that par in the early designs. The old airplane hanging from the ceiling of the Conservatoire National des Arts et Métiers was Clement Adler's steam powered 1897 Avion III. He claimed that it flew, but the French Army observers said it didn't. This article needs some more work...the 'supercomputer from the 1970s' is an American-made Cray-2, released in 1985. 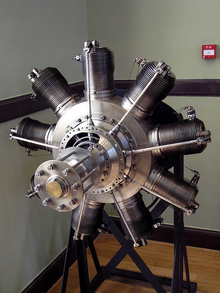 Both of you are mistaken, that is a Gnome rotary engine used in a French airplane in WW1. It was famous for having an enormous amount of torque and would turn shorter than the German planes of that time. 2 cycle? hardly, that is a "rocker arm" on the tip of the cylinder barrels, and one seems to be missing. AFAIK, it is the only engine ever built that the crankshaft was stationary and the engine it self turned. According to what I have read, it would turn quite sharply in one direction, but you needed a "ten acre field" to turn in in the other direction. Way back there I took an interest in any kind of engine made, and I'm one of the few folks still around that can "time" a Model A ford. Great blog! I like the photo! Ingenuity is timeless! The word antique certainly does not imply worthless. Thanks for this story. Vive la antiques!